← Take My Word For It: This Book Is Asam! Posted on January 24, 2013, in Misspelled, Notes and tagged children writing, funny kids writing, Humor, kid writing, misspelled words, pennies, popcorn parties, Stuff Kids Write. Bookmark the permalink. 16 Comments. 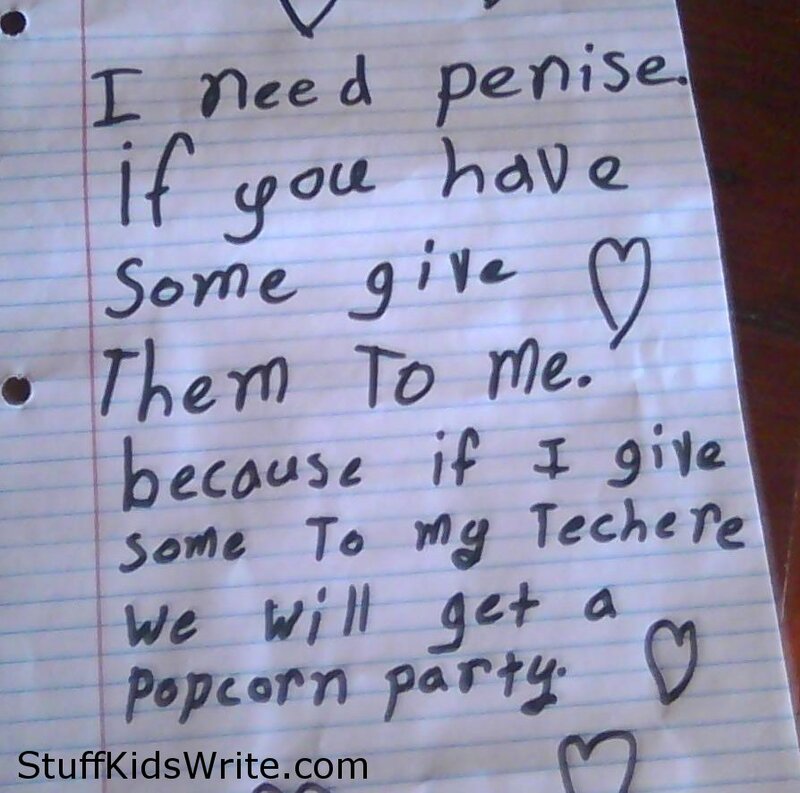 From now on, I’m having a popcorn party every time someone gives me penise. Pennies. Dang, it took me at least twenty seconds to figure that out after reading this. I must be slowing down. Good thing my kids are old enough to spell! I’d be in serious trouble. lol! that totally cracked me up! This is just priceless. Perfect for display at their future wedding reception. Popcorn for penise. Sounds like a logical trade. Hello! Just wanted to let you know I’ve nominated you for the Very Inspiring Blogger award. You can find more details at my blog, bipolarbetty2. Thanks for creating a great blog! (And sorry about the informal mass notification, you can delete this comment if you’d like.) Have a great day! I remember when pennies meant much more to me than they do now. I thought every one I found was good luck, whether it was heads or tails. I also remember back when I spelled practically everything wrong…but still got the point across. I love this blog. This is great! So funny! I have a six year old that brings home some great laugh-worthy stuff. I think I will email you a sample or two! Giggles, I Snorted on this one!